With Create Ringtone it is easy to load into phone memory music, ringtones, podcasts, video, MS Office documents and PDF files. Any new content can be sent directly to the phone via WAP protocol. If the computer is connected to the Internet, any other physical link to the phone becomes redundant. 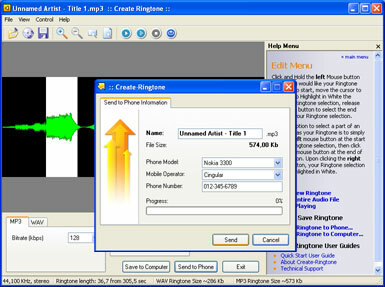 Using data exchange protocols, Create Ringtone sends the newly made content directly to the phone. A new ringtone or wallpaper can become a present for relatives and friends. By just choosing a global operator and typing the phone number you can forward both greetings and presents. IrDA, Bluetooth, and USB connectivity are equally supported. Automatic conversion and file transfer take a minute or so. The program’s intuitive interface makes the job of creating a new tune or a background a real pleasure. Create Ringtone saves both time and money that might have been spent with a content provider. It gives independence for creative thoughts and means to apply them in custom phone profiles. With wide range of supported audio formats one can convert any audio file into a trendy ringtone with a few mouse clicks. If the quality of sound needs improving a user can change the sample and bit rate or amplify the sound. The preview option gives the exact idea what the new ringtone will sound like.